Final Fantasy V is the second of the long running series to come out on the Super Famicom. There were plans for a US release, which famously was delayed into oblivion. The game was originally to be released as a sequel to Final Fantasy II, and be called Final Fantasy III. However, Square deemed it too difficult, and delayed it. Eventually, they released Final Fantasy VI as Final Fantasy III in the US. They were then going to release Final Fantasy V as Final Fantasy Extreme, but they afterwards decided that the graphics were too primitive to be warrent the release. It was canceled in late 1994. Square officials also stated that if they worked on Final Fantasy Extreme, then Chrono Trigger would have been delayed. The game was first shown at the Winter 1993 CES, though not much info was given at that time. 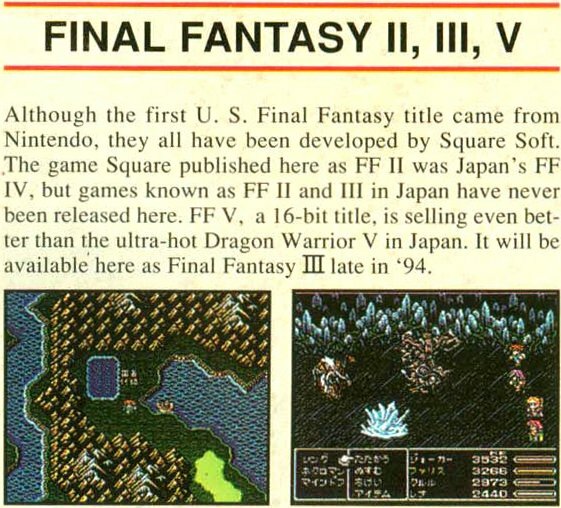 The January 1994 issue of Nintendo Power stated that it would be released in late 1994 as Final Fantasy III. The game was announced as early as the beginning of 1992.